A Stetson faculty member, staff member and two students were recognized for their outstanding achievements at the Florida Campus Compact Awards Gala in Miami on Oct. 25. 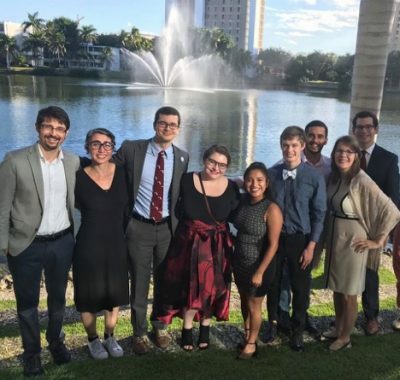 From left, at the University of Miami campus for the Florida Campus Compact Awards Gala were: Andy Eisen, Ph.D.; Pamela Cappas-Toro, Ph.D.; Kevin Winchell, Amber Finnicum-Simmons, Rubyselda Moran, Nathan Bodger, Cristian Cuevas, Savannah-Jane Griffin and Maxwell Droznin. Pamela Cappas-Toro, Ph.D., assistant professor of World Languages and Cultures (Spanish), received the Early Career Engaged Scholarship Faculty Award honoring a faculty member who bridges higher education’s academic and civic missions through exemplary integration of community-engaged learning into the curriculum. Cappas-Toro’s work includes directing La Casa Cultural Latina, an interdisciplinary cultural center providing ESL education for the community, and co-directing the Community Education Project, Stetson’s higher education in prison program with Tomoka Correctional Institution in Daytona Beach. Maxwell Droznin, Community Engagement coordinator for the Center for Community Engagement, received the AmeriCorps VISTA Member of the Year Award, which recognizes a VISTA who has demonstrated great success in reducing poverty through capacity-building efforts between higher education, non-profit and civic institutions in local communities. Serving the DeLand community as a full-time Volunteer In Service To America (VISTA) from November 2016 to November 2018, Droznin worked with community leaders to establish the Artisan Alley Farmers and Makers Market as a non-profit that accepts SNAP/EBT to expand food access and support local farmers, and also established the Spring Hill Gardeners Association as a non-profit that expands food access and educational programming in the Spring Hill community of southwest DeLand. Rubyselda Moran, a senior majoring in Sociology, received the Student Excellence in Service Award, which recognizes the student who best exemplifies civic and community leadership. Since 2014, Moran has interned with the Boys and Girls Club of Volusia/Flagler Counties as a member of the Bonner Program, beginning as a youth mentor and tutor, continuing as a program manager, and now serving as a development and marketing coordinator – each position aligning with her academic interest of sociology and her career goal of leading the Boys and Girls Clubs. Nathan Bodger, a senior majoring in Religious Studies, received the Newman Civic Fellows Award, which recognizes and supports community-committed students who are change makers and public problem-solvers at Campus Compact member institutions. As one of Stetson’s Environmental Fellows, Bodger has led sustainability programming and research efforts to reduce Stetson’s carbon footprint, and also initiated the Stetson Revolving Green Fund (RGF) – the first student-imposed “Green Fee” for sustainability projects in the country.